You are right, threaded rods are available and not so expensive, and not only in 1m sizes but also 2m are available. Unfortunately threaded rods are bending easily at 1m lengths even if they are 8mm. For CM 1.2m antenna, to be able properly install dualfeed LNB sidearms >than 1m are needed (something like 1.2m). My C band mount for my 1.2M CM dish arrived today - thanks for the prompt shipping ! As for replacement arms I suspect tubing would be preferable if only for weight reasons, plus tubing might be more rigid ? Just got to make the dual feed plus a collar so it fits the 42mm clamp. @G4WIM Yes, tubed feedarms are lighter and more rigid as well. 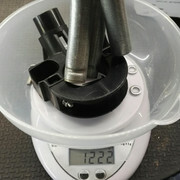 Comparing to original feedarms and holder, feedarms made of 10mm tube plus all fittings weight is almost 200 grams less. Could you please post couple of pictures? I used the tube approach on my winegard dish for eme , which proved strong enough to support a twt at the feedpoint! @G4FRE any solution is good when it gives acceptable final performance. Guys, where I can find simple drawing of the dual-LNB you all use? I wish to find out the length of the feedarms for CM 1.2m to be able install LNB properly. Speaking about sizes and dimensions of Channel Master antennas... I have made this collage where you can find some data about CM antennas in different sizes (I did not include .35m and .75m antennas though). Position of the focal point is very important parameter. 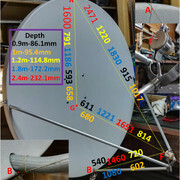 All antennas have 22.6* offset angle. Am I right that something like this should be inserted in front of antenna? Yes, I know it should be made out of copper, but this is just a dummy which I will use for tests (not real reception or transmitting). something like that, but not quite. The LNB has a small horn or dielectric lens on the end of the 22mm pipe / wave guide and the pipe only protudes about 5mm in front of the 105mm disk.